...but after a year of living with the Apple Watch strapped to my arm how do I feel? Hands down the most impactful aspect of being an Apple Watch owner is that it has the ability to ween you off your iPhone. But how can that be, isn't the Apple Watch an iPhone accessory? Yes and no. As of right now you still need an iPhone in order to use an Apple Watch (although just this week Apple announced that Apple Watch apps need to be able to run native on the iPhone...a move that could indicate more iPhone independence just down the road...a future Apple Watch with cellular???). So yes, you need an iPhone for an Apple Watch to function but now you can do more without your phone in-hand. If you iPhone is on a known wifi network then you and your watch don't have do be within Bluetooth range to communicate. So when I am at work or at home my iPhone isn't always in my pocket anymore. I still get texts and can still answer the phone but don't have to scramble for the phone anymore. The instant notifications to your wrist also greatly reduce the number of times you have to look at your phone. I really only use my iPhone when I sit down to do it now, not as an instinctual habit to check things. This may seem petty and minor, but breaking the "iPhone habit" has been quite refreshing. I was really looking forward to using my Apple Watch to monitor both the quantity and quality of my sleep, but this has yet come to fruition. Until Apple solves the performance issues with natively running Apple Watch apps I don't see this changing. But even though it's crap at monitor sleep I do still wear the Apple Watch to bed every night. Why? Because I am no longer depending on my iPhone for notifications. My iPhone is totally silent (no notification sounds and no vibrations). So if I need to get a phone call during the night it is going to need to come through my watch. Do Not Disturb is automatically turned on every night so I don't get woken up when someone reaches out to me on Twitter, but I am notified when my teenage daughter calls me from a friend's house an hour after I've gone to bed. No more sleeping through phone imporant phone calls, but after 11pm at night only people from my VIP list "ring through" to my wrist...the rest wait until morning. I also use the Apple Watch as my alarm clock and not via nightstand mode like most people. Because it is on my wrist at night I get a gentle but persistent tap on the wrist to wake me and it is so much more pleasant than any alarm sound you can conjure up. Since I wear my Apple Watch darn near 24x7 (I am only without the watch when it is charging) I do switch wrists at night to let the skin on my left wrist breathe a bit. Back many years ago when I wore a traditional watch I would occasionally get a rash from my watch and would have to stop wearing it. Switching wrists at night has kept this from happening with the Apple Watch, even with 22 hours of wearing it per day. Some might argue with me that I must not use my Apple Watch for fitness tracking, but I do. I work out for 60-90 minutes a day with my Apple Watch. This does drain the battery quite efficiently, but that just means I charge the watch a bit longer in the evening when I am in the shower. And on the weekends I am generally out running or cycling during the day which means an extra shower and another opportunity to charge the watch. As long as I have about 24%-30% charge when I go to bed I'm fine, and then my morning routine allows plenty of time to top the charge off to 100%. 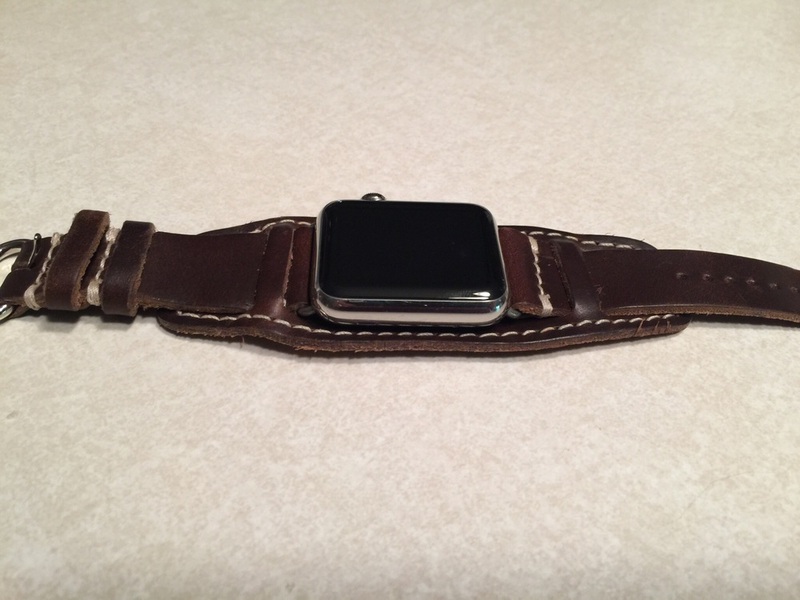 I will say that I am loving my NOMAD Apple Watch charger. Besides breaking my dependence on my iPhone, there is no "killer" feature of Apple Watch that makes it a must have tech device. It is simply an accumulation of all the little things the watch can do for you during the day. When I started carrying an iPhone around with me in the summer of 2007 I stopped wearing a watch and didn't start again until almost 8 years later when my Apple Watch arrived in the mail. So I was never a watch enthusiast by any means. My Apple Watch is not something I would categorize as essential. I could function perfectly fine without my watch, but it would feel strange being so dependent on having my iPhone within arms reach at all times again. I weened myself of that iPhone dependency a year ago and I really don't want to go back. That in and of itself is worth the price of admission into the world of Apple Watch...at least for me.